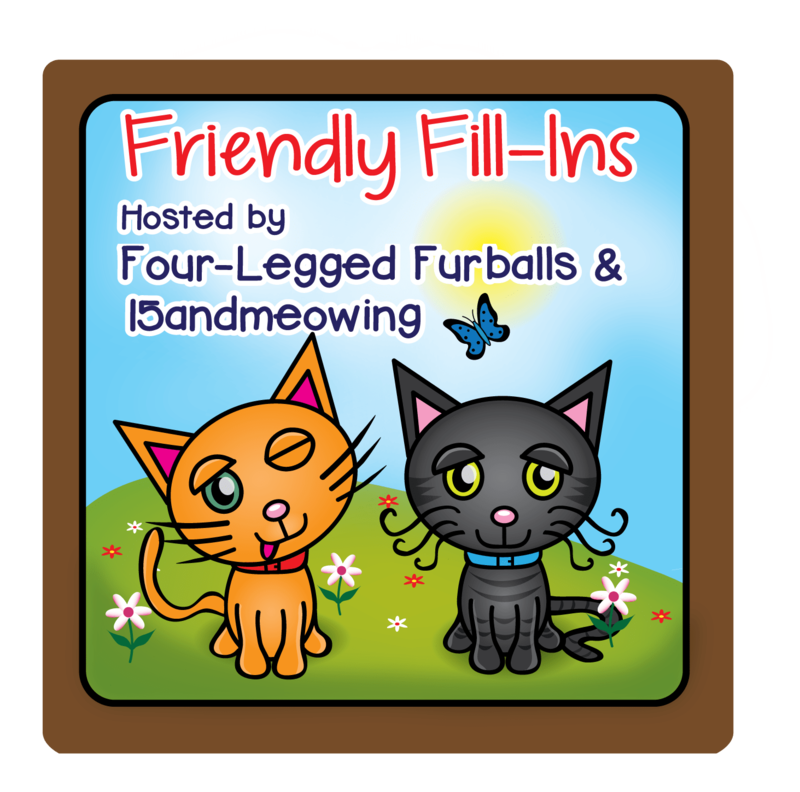 This entry was posted in Blog Hops, Friendly Fill-Ins and tagged Feline Friday, friendly fill-ins blog hop, friendship friday blog hop, Trouble by pilch92. Bookmark the permalink. It sure is 🙂 Not much trouble though. Trouble looks like she earned her name today! Maybe that should be Binga’s name too. You do a good job on the cat toys. I think the purple bow tie is the favorite around here. Martha’s ice cream cones are put up for when his mommy gets back from Houston, whenever that may be. Drac loves to try to toss the bow ties. He does a good job with that. They love to play. Thank you. I am glad the kitties like the toys I made. Have a blessed week too. Your kitties are very blessed to have you in their lives. Ah, Trouble, I totally believe your innocence. Seriously. PS: your mom makes excellent cat things. I still have the pink mat she made for Leia, and always will. 1. I want to make the house a better place for the Mews each day. Today I found dry food they went nuts over. 2. My cats are my companions. Love the picture of Trouble. I am with you all the way, about cats being your life. I feel the same way. You all have a great day. No one can pass up the whipped cream! Cuddles with cats and reading are two of the best things ever. The photo of Trouble and caption made me LOL! 1. I want to make picture taking a part of my happiness again. 2. My happy times are returning after some times of struggling. 3. A day in my life always includes watching the Ibis, Checkers the Great Egret, Horatio the Blue Heron, the Storks, Noir the Anhinga, and AllieGator in the afternoon at the pond. 4. Good things always happen to those who open up the opportunity. Thank you for the Fill-ins! Have a good weekend and thanks for hosting the Friday fun! Those were great and so is that whipped cream stuff! Trouble in trouble!? Such a sweet face, whipped cream and all. Trouble looks like s/he would do it again, if given the opportunity 😉 Totally agree with you on “Good things happen to those who put the effort in.”… In my experience, the ones who wait for good things to simply be dumped in their laps are felt far behind the ones that will get out there and work for what they want. I certainly agree with your position that you won’t be successful if you don’t do any effort in your life, environment and so on. All we need in a bit of luck and a lot of strength to be happy. 1. I want to make the world a kinder place. 2. My priorities are spot on for my life. 3. A day in my life always includes telling my husband that I love him. 4. Good things happen to those who are kind. I’m sorry you get blamed for everything. Mom and dad still love you though. Do you need a mouthpiece or do you need a napkin, Trouble. Oh, Trouble. That’s too funny. Your toys are amazing. I love how bouncy they are. Every once in a while, I get geriatric Jezebel to play while Tilly lounges and watches. Heh… Be well! LOL! You really do look like the cat that got the cream. If we had whipped cream around here, we would help ourselves too! Yum! As for a larger item I have a pattern for a continuous afghan square. It goes quickly and turns out very pretty with either variegate or plan yarn. If you would like the patter let me know. guyz….we vote for a cat bed for each oh ewe; then a cat affa gan for everee one…. We are mom’s life too. Yes, our pets are our life as well! They deserve nothing less, because they give us so much love. I want to crochet a blanket, but somehow life always gets in the way *sigh*. Great answers! I think you would make a pawsome cat bed! We like your answers to the fill ins. Mum realized that she did not have the link to your blog in our post so she fixrd that. WE do like those toys. MOL! Yeah, I don’t know why you were blamed for the whipped cream. I’d et da whipped cream too! And we’d luv to see an afghan! MOL! 🙂 If I make one, I will show you. MOL it looks like the effort to get to the whipped cream paid off! Purrfect picture! Purrfect answers! I have great respect for those who can crochet, like you. Both of my grandmothers, my mom, and my sister are all crocheters, but I have no skills in that realm whatsoever. All of your other answer, though, I can completely relate to those. 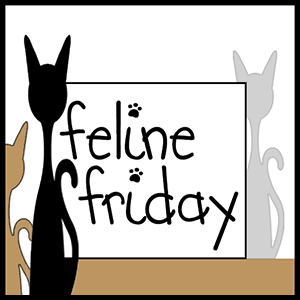 Kitties, kitty cuddles, books, blogs – those are all such wonderful things!